Observe the Sardar Vallabhbhai Patel's Birth Anniversary as Rashtriya Ekta Diwas (National Unity Day). Sardar Patel's Birth Anniversary to Celebrate as National Unity Day: Celebration of 31st October 2017 as National Unity Day on the occasion of Birth Anniversary of Sardar Vallabhai Patel. Sardar Patel's birth anniversary to celebrated as National Unity Day. The new government has grand plans to celebrate the day as "Rashtriya Ekta Diwas" or National Unity Day, as a tribute to India's first home minister. The government has decided to observe the birth anniversary ofSardar Vallabhbhai Patelon October 31 as "Rashtriya Ekta Diwas' (National Unity Day) every year. The day will be marked by administration of a pledge to all government employees as well as school and college students, to maintain the unity and integrity of the country. Sardar Patel, nicknamed the Iron Man of India, was the first home minister of the country and is credited with persuading more than 500 princely states to accede to the Indian union post-Independence. Prime Minister Narendra Modi had earlier as Gujarat chief minister launched an initiative to install the tallest iron statue of Patel, a Congress leader from Gujarat, in an island in the river Narmada. 2. Inter-School elocution and essay competitions in the area of unity. 3. Dramas, Songs and Plays on the theme of unity and personality of Sardar Patel. The theme of celebration may be unification, strengthening and bonding of the Nation. You are requested to issue necessary instructions in this regard. Sardar Patel's birth anniversary to celebrated as National Unity Day. The new government has grand plans to celebrate the day as "Rashtriya Ekta Diwas" or National Unity Day, as a tribute to India's first home minister. The government has decided to observe the birth anniversary ofSardar Vallabhbhai Patelon October 31 as "Rashtriya Ekta Diwas' (National Unity Day) every year. The day will be marked by administration of a pledge to all government employees as well as school and college students, to maintain the unity and integrity of the country. Sardar Patel, nicknamed the Iron Man of India, was the first home minister of the country and is credited with persuading more than 500 princely states to accede to the Indian union post-Independence. Prime Minister Narendra Modi had earlier as Gujarat chief minister launched an initiative to install the tallest iron statue of Patel, a Congress leader from Gujarat, in an island in the river Narmada. The eminent lawyer,The iron man of India, defence minister of independent India, the kings of king Sardar vallabhai patel jayanti on 31st October. Let us celebrate his birthday in all our places. He was the lord, he was the doyen of shakthi shaali Baharat, he was the dynamic personality. He did it what he told. Government of India has decided to observe the birth anniversary of Sardar Vallabhbhai Patel as Rashtriya Ekta Diwas (National Unity Day) on 31st October. The occasion provides us an opportunity to reaffirm the inherent strength and resilience of our nation to withstand the actual and potential threats to the unity, integrity and security of our country. In this connection your attention is also invited to Union Home Minister's DO letter No. I-19034/4/2015-NI-II dated 23.10.2015 to all Chief Ministers of States, a copy of which is enclosed for ready reference. With a view to ensuring that the "Rashriya Ekta Diwas" is celebrated in a befitting manner, it is requested that the school going children studying in Government and Government-aided schools in the States & UTs, may be encouraged to participate enthusiastically in the "Run for Unity" that is being organised at your State/District headquarters. A pledge taking ceremony may also be organised in the schools on 30th October, 2015 (as 31st October, 2015 falls on a Saturday this year) before the schools close for the day. A bilingual text of the Pledge is enclosed. In addition, the schools may be encouraged to take up additional activities like poster making, painting, elocution, quiz, etc., on the relevant themes. We look forward to hearing from your State/UT about the activities undertaken on this nationally important occasion. Details of any innovative activities taken up in any school in your State to celebrate "Rashtriya Ekta Diwas" and helping the students to imbibe messages of Unity, Integrity, Safety and Security of the country, may please be shared with us. With a view to foster and reinforce our dedication to preserve and strengthen unity, integrity and. security o.f our nation Rashtriya Ekta Diwas (National Unity Day) will be observed all over the country on 31st October, 2015 to commemorate the birth anniversary of Sardar Vallabhbhai Patel. The occasion provides us an opportunity to re-affirm the inherent strength and resilience of our nation to withstand the actual and potential threats to the unity, integrity and security of our country. therefore, request you to give appropriate directions and guidance to all concerned so that the Rashtriya Ekta Diwas (National. Unity Day) could be organized and celebrated in a befitting manner. A Pledge taking ceremony may be organized. 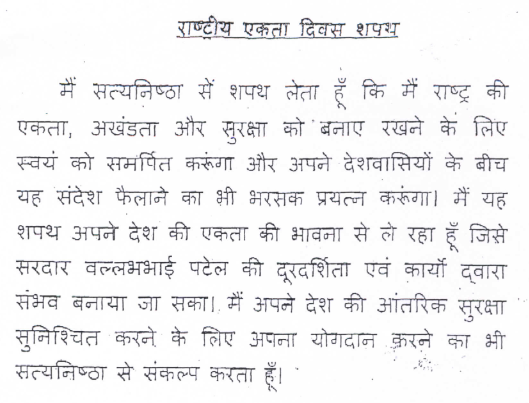 The bi-lingual text of the "Rashtriya Ekta Diwas Pledge" is enclosed. As 31st October this year falls on a Saturday, the Pledge Taking Ceremony may be organized on the day prior, that is on 30th October at the time of closing of the offices/institutions concerned. A "Run for Unity" may be organized at the State/District Headquarters, Involving people from all sections of the society, so that a message of national unity could permeate every part of the nation and the society. In order to boost the sentiments that our nation will not countenance any force that seeks to threaten the unity, integrity and security of our nation, a ceremonial parade including a March Past may also be held in the evening of 30th/31st October by the Police and the Para-military Force personnel. ******************************* No.F.24-1/2017-EE.8; Dated: 11-10-2017:: Government of India, Ministry of Human Resource Development. Department of School Education & Literacy. Celebration of 31st October, 2017 as National Unity Day on the occasion of Birth Anmversary of SardarVal1abhai Patel-reg. 3. Dramas, Songs and Plays on the theme of unity arid personality of Sardar Patel. 4. Most creative slogan/painting contest on the Unity theme. The theme of celebration may be unification, strengthening and bonding of the ntation. The Rashtriya Ekta Diwas (National Unity Day)will be observed this year also as usual throughout the State on 31st October, 2016 with a view to observe the birth anniversary of Sardar Vallabhbhai Patel. The Rashtriya Ekta Diwas provides us an opportunity to re-affirm the inherent strength and resilience of our nation to withstand the actual and potential threats to the unity, integrity and security of our country. 2. It is therefore, requested that the "Rashtriya Ekta Diwas" could be organized and celebrated throughout the State on 31st October, 2016 in a befitting manner and a "Run for Unity" organized at the State / District headquarters, involving people from all sections of the society, so that a message of national unity could permeates every part of the nation and the society. 3. It is also requested that on this occasion, the Rashtriya Ekta Diwas Pledge will be administered among all the Government Employees etc. on 31.10.2016 in the State. 4. Copy of Rashtriya Ekta Diwas Pledge to be observed during the Rashtriya Ekta Diwas (National Unity Day) on 31st October,2016 communicated by the Government of India, is enclosed. Diwas (National Unity Day) is observed on 31st October 2016 in a manner as stated above and also the Rashtriya Ekta Diwas Pledge is administered to all concerned on 31-10-2016 are enclosed herewith.